Instant dosa with rice flour and cooked rice is easy to prepare if you have rice flour, wheat flour (or all purpose flour) and also some cooked rice at home, as you can easily prepare instant dosa batter at home using very few ingredients available at home. I recommend using cooked white rice as that will give a better texture, but you may also use cooked brown rice if that is what you have. You can make 8 to 10 medium sized dosa using this amount of ingredients which would be probably enough for two servings. The instant dosa with rice flour and cooked rice is also using a little amount of wheat flour or all purpose flour, however this instant dosa is nothing like wheat dosa in texture or taste. This instant dosa can be made crispy if you use ghee or sesame oil (or any oil or butter as you like) while you prepare dosas. See my post here on how to make crispy dosa if you like to see tips on preparing crispy dosas. Try this instant recipe using rice flour, wheat atta flour (or all purpose flour) and also few other ingredients. 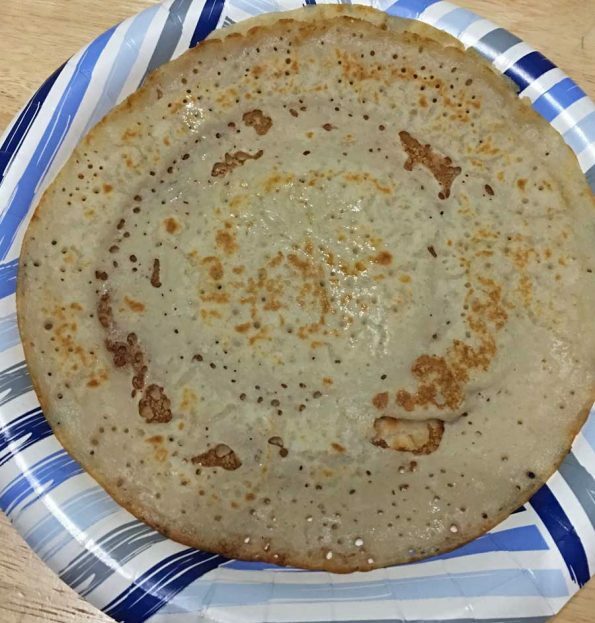 I adapted the basic recipe for instant dosa with rice flour from here. I adjusted the amount of water called in the original recipe, as I needed a little more water to make the batter. 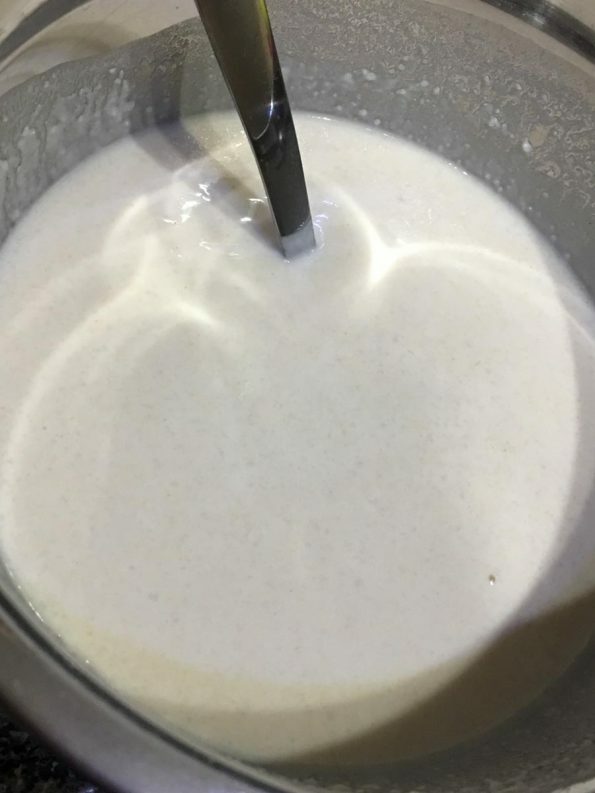 The amount of water may slightly vary as you make it, as sometimes the amount of water needed to make the batter can also depend on the kind or brand of flours you use. So always add little water initially and increase the amount of water as needed when you make the batter for instant dosa. So here is how you can make easy and instant dosa following this recipe for instant dosa with rice flour and cooked rice. Instant dosa with rice flour, cooked rice and few other ingredients can be prepared quickly and easily to enjoy an easy and instant South Indian style breakfast. In a bowl, mix together the dry ingredients - wheat flour and rice flour, baking soda and salt until well mixed. In a blender, grind together the cooked rice, yogurt and water until you get a smooth mixture. Transfer the wet mixture to the dry flour mixture and slowly mix in the ingredients without forming any lumps. 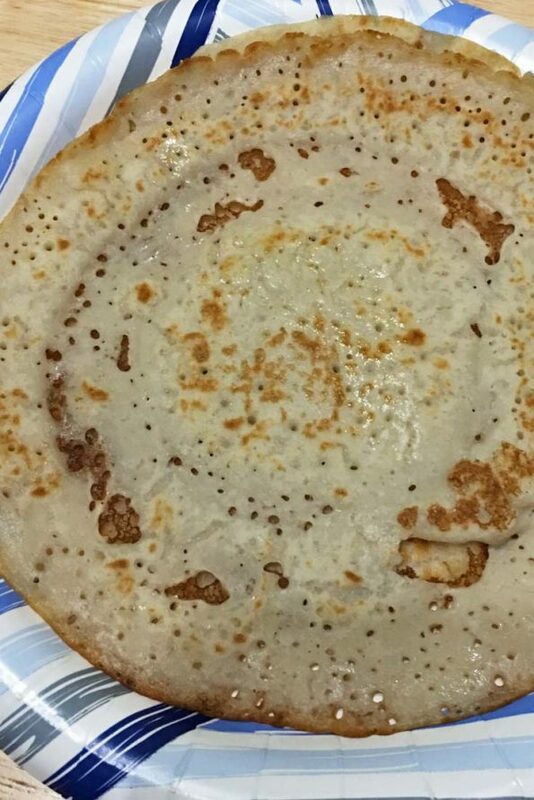 It is important that the dosa batter should have a smooth consistency without lumps. You can use a balloon whisk to mix the batter, which will help you achieve a smooth texture easily. Now this instant dosa batter doesn't need any fermentation and you can use it right away to make the dosas if you wish, however you may also cover the bowl and keep it closed for about half an hour for better results (this is not necessary though). Once the batter is ready and you are ready to prepare the dosa, heat an iron pan or non stick pan, grease with oil or ghee. Add one to two ladles of instant dosa batter to the pan, and spread in gently in circular motion, just like you make for regular dosa. 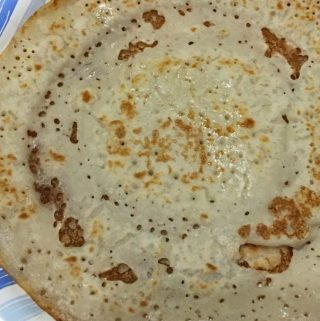 However, do not try to fill in any gaps with the batter, as that is totally fine. AS the dosa begins to set in about a minute, add one or two teaspoons of ghee or oil, which will help to make the dosa more crispy. 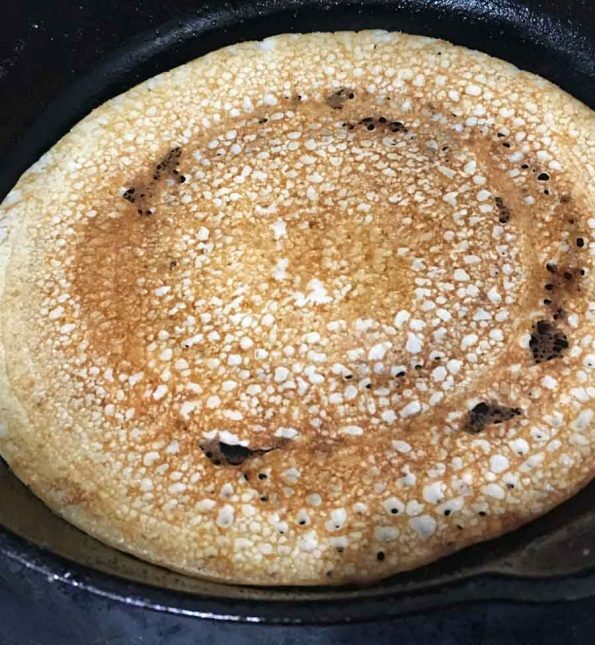 Once the dosa is cooked on one side, gently flip the dosa, starting from the sides and moving inward, and cook the other side too which will cook more easily. Serve the dosa hot with sambar, chutney or any of your favorite side dishes, enjoy! 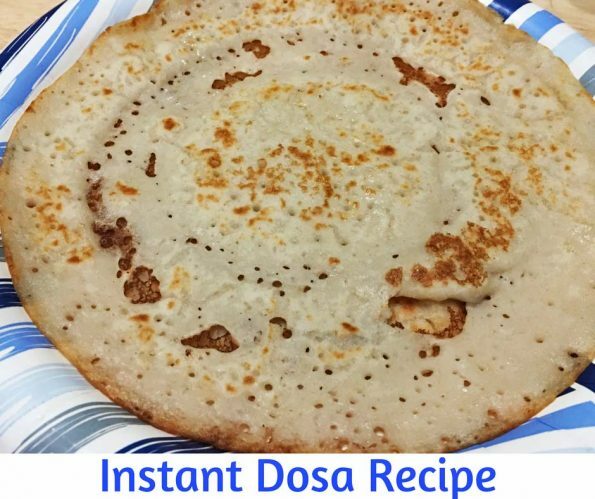 Hope you found this post on instant dosa with rice flour and cooked rice helpful in making easy and yummy instant dosa for breakfast or dinner.